Camp Peaceprints had its best year yet in 2015! “Unity in Community” was our theme for our second year at St. Mary’s School for the Deaf. We served almost 50 youth who were enthusiastic and eager to learn about and practice being a community guided by peace and nonviolence. · Our diverse staff included dynamic members of WAVE (Women Against Violence Everywhere) who mentored and taught the youth and whose work in the inner city made our staff team even easier for campers to relate to. 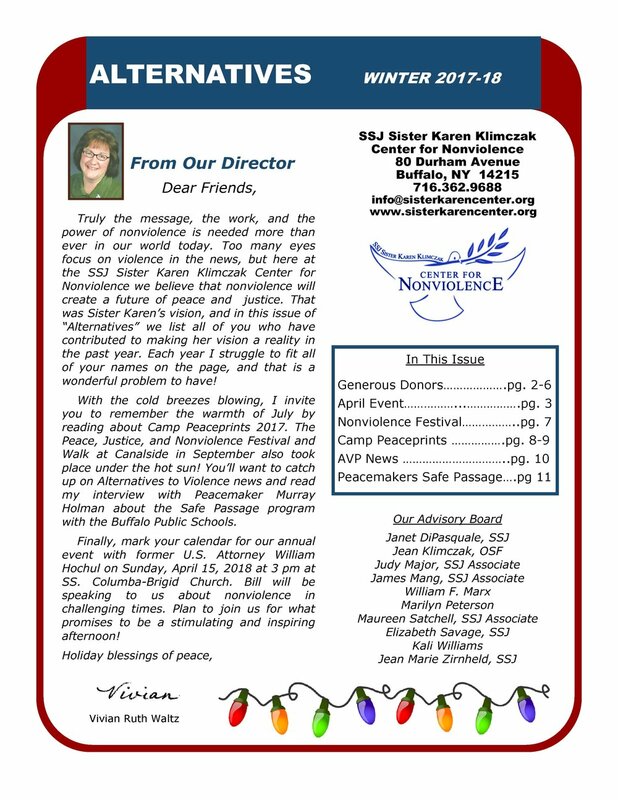 Other collaborators were the Erie County Council for the Prevention of Alcohol and Substance Abuse, the Interfaith Peace Network, St. Mary’s School for the Deaf, the SSJ Sr. Karen Klimczak Center for Nonviolence, St. Columba-Brigid RCC, Veterans for Peace, and the WNY Peace Center. · Our great group of youth assistants included Young Neighbors in Action teams from New Hampshire and Wisconsin; our 2nd-year UB School of Social Work Intern, Alessandra Waylon; young women from TRY (Teaching and Restoring Youth); and a few very gifted young men from Buffalo Public high schools. · Our increased diversity also included four Foster Grandparents from the Catholic Charities program who were wonderful supporters and mentors for the children and youth. · The shorter day – 10am to 3pm – enabled the youth (and the adults!) to be fresh and rested each day, and to bring greater intensity to the Camp time. · Increased swimming time (4 one-hour sessions at the Canisius College pool) allowed campers to build self-confidence by overcoming their fears, and fostered trust and a feeling of community. · The rotating station format gave an intimate experience to the campers as they learned in small groups from the speakers, artists, activists, and teachers who graced the camp. · Activities included yoga; trust-building, communication, and conflict resolution exercises; exploring nonviolence, history, current events (particularly nuclear issues and human rights), and social change; submitting our ideas about our neighborhoods’ needs to the Mayor; singing the “Peaceprints”song; creating lively drumming circles; and enjoying outdoor recreation in the sunshine. · We learned from the Peaceprints Prison Ministry how important it is to reach out for the help we need to heal from hurts and be our best selves, and decorated bags for their Holiday Gift Bag Project. · Our Art Project was a tremendous experience all by itself, with children sharing themselves and their skills on pieces that became part of an intricate, unified mandala design; later put on blue fabric representing the one blue sky above us – a reminder of the peace we want under it – and surrounded by our peaceprints and expressions of our hopes, dreams, and deepest feelings for a better world for us all. o in and around the Tri-Main Center-- to the Brewster Street Urban Farm; the People’s Park with storytelling from Karima Amin and crafts with Aspire (joining with people with developmental disabilities); Buffalo Arts Studio and their mural project, and found-objects artist and author Betty Leader; and a stop at Landies Candies where they kindly offered free samples to the whole camp! o to the Erie Basin Marina and Canalside, where we enjoyed the new environment, shared lunch and ice cream, and got tours from the Buffalo History Museum and Buffalo State College’s Maritime Center. Jan Burns, who plans and delivers the wonderful art projects for Camp Peaceprints every year, was at Camp for our Community and Family Potluck Celebration on the night before the last day of Camp, and brought her elderly mother who helped with our finishing the mandala. The next day, Jan called to say her mother passed away that morning. It was very touching and a very real reminder – both of how beautiful and constant a life of service can be, and how quickly and unexpectedly our time here on this earth can end. It makes it even more obvious how we need to love each other and use our time well. The campers learned many great lessons about the gift of Unity in building our Beloved Community, as we all did.